Formerly known as the Caribe Tower, GR Caribe by Solaris, deluxe all inclusive resort is the newest addition to the Solaris Family. Once you arrive you will be delighted by its exquisite mexican-moroccan architecture and decoration, which create a graceful atmosphere. GR Caribe is located next to Royal Solaris Cancun. Enjoy your stay with the comfort and elegance of the Lobby, with comfortable day beds and a charming environment, have a drink from the Lobby bar and listen to soft music. Live jazz music and belly dancers are often performed here as well. Zeferinno Plaza & Socorrito Plaza are two wonderful places to spend some time reading or chatting with friends or family, located outdoors within the patios of GR Caribe by Solaris. The waiters are always strolling through the areas, taking care of the needs of the guests. Have a complete breakfast at Cafe Solaris every morning and a delicious fine dinner every night at Veneto. Staying at GR Caribe by Solaris also grants guests access to use the facilities of Royal Solaris Cancun, right next door, allowing guests to delight their taste at Rosmarinus and Marco Polo Restaurants as well as the snack bar and Pizzalissima, the sushi bar, Las Fuentes restaurant, the pizza stand at the pool area of Royal Solaris and other facilities of their sister resort. As a guest of GR Caribe by Solaris, you will have full access to the facilities of Royal Solaris Cancun, right next door, that’s two whole resorts for you to spend your vacation with even more choices for entertainment, taste and relax. GR Caribe by Solaris already has what it takes to make your vacation unforgettable, in addition to its Restaurants, Plazas and pools, you may use as well all the Restaurants and Bars located in Royal Solaris, your kids can have fun at the Mini Club and Water Park and your whole family can have a great time with the activities of the entertainment staff at the pools area, where you could earn a prize or two for just having a terrific time! Your kids can spend a splendid vacation at the Kids Club at Royal Solaris Cancun. The staff have a complete weekly activities program to make every day different from the other, with fun supervised games and activities indoors, arts and crafts, video games, movies and more. Keep your body in good shape at the Fitness Center in Royal Solaris Cancun, which is equipped with all you could need for your daily training with an amazing view to the Nichupte Lagoon. As a guest of GR Caribe you are free to use the Fitness Center, open Monday to Friday from 6:00 a.m. to 7:00 p.m & Saturday & Sunday from 6:00 a.m. to 5:00 p.m.
Ride the Noah’s Ark and begin an splashy fun adventure at the Water Park. Your kids can have wonderful time sliding, swimming, squirting and splashing at the theme water park. A new place where our youngest guests will enjoy this special area for the kids located in sister property, Royal Solaris Cancun. This new colorful playground area allows them to have fun while on vacations in Cancun. Opens daily from 9am to 5pm. From 0 to 4 years old. Parents must be supervising their children at all times. With full access to the Restaurants and Bars at the facilities of Royal Solaris Cancun, you can enjoy a total of 11 different choices to satisfy your taste and thirst. Buffet breakfast and lunch, international specialties, right-out-of-the-oven pizzas and your favorite drinks at virtually any time. The Restaurants and Bars at GR Caribe: upscale taste. 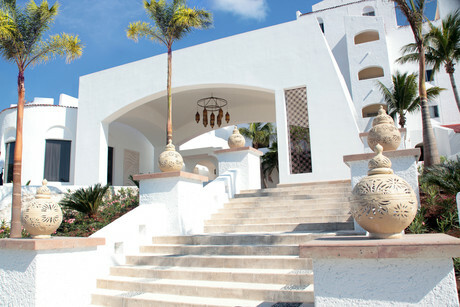 Guests at GR Caribe All Inclusive Resort can choose from five different type of accommodation. With mediterranean stylish decoration and first class amenities, the rooms offer the finest atmosphere and comfort. Admire the beautiful views to the Nichupte Lagoon or the Caribbean Sea as you have a glass of wine, our rooms create the perfect ambience for a romantic sunset. Taste the flavors of old Italy at Veneto Restaurant in GR Caribe by Solaris. Try delicious dishes like grilled prawn with rosemary sauce, salmon with eggplant medallions in capers sauce, cuscus with swordfish and dried chillies vinaigrette and cannelloni stuffed with mascarpone cheese. Veneto will wrap you with its classy atmosphere and charming decoration, it's as exquisite in space as in flavor. A formidable beach front international restaurant at GR Caribe with a stunning view to the Caribbean Sea. Enjoy the à la carte menu with remarkable artfully design dishes from our chef, your senses will be overjoyed of flavor: taste fresh seafood, an extensive array of mexican recipes and nouveau fusion cuisine dishes. The place to start off a day of your Cancun all inclusive vacation. Server yourself your personal choice of breakfast dishes such as waffles, omelets, fruit, juice and coffee. You will be catered by the friendly waiters who will be charge of providing you the best service , as a tradition of our all inclusive resorts. Enjoy an upscale vacation at GR Caribe by Solaris in every way. The Snacks are no exception to the luxury of the resort. Savor the pleasure of the gourmet snack bar with an extensive selection of light snacks, vegetarian dishes, the classic hamburger & hot-dogs, french fries and more. Raise your arm to call the waiter and be served right at your lounge chair. The Snack bar is located at the pool area in GR Caribe. 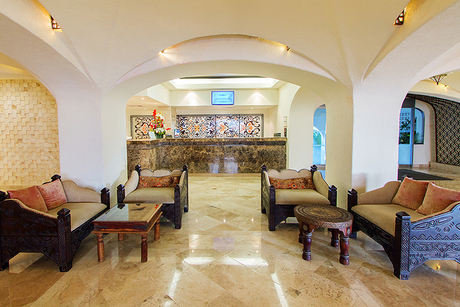 Charming place at the entrance of the resort, serving all guests from 10am to 4am. Ask for your favorite drink anytime of the day and spend a time at the lobby with a relaxing ambience and live jazz music (when available). The waiters are always happy to serve you. Since early morning the action and fun is on at GR Caribe. The entertainment crew invite all guests to join the activities at the pool area of GR Caribe with different games and exercises every day. Not only that, as a guest of GR Caribe you are free to join the pool activities of Royal Solaris Cancun. Several sports, games and tournaments for all the family for non stop action every day. Live intense moments while you savor a delightful dinner every night at the Tehuacan ballroom at Royal Solaris Cancun, right next door from GR Caribe. Savor every night a different style of cuisine that matches the show presented on stage. The magnificent performances will transport you around time, space and beyond imagination with acts like the 20's show, with music and dance steps from that decade. The talented performers also have several acts from famous Broadway shows like Wicked or Rent along many others, as well as they will show you dances from around the planet, you will want to dance to the latin rhythms of Salsa and Cumbia in the Latin Show. Please note: Tennis court will be closed until May 18th, 2018. 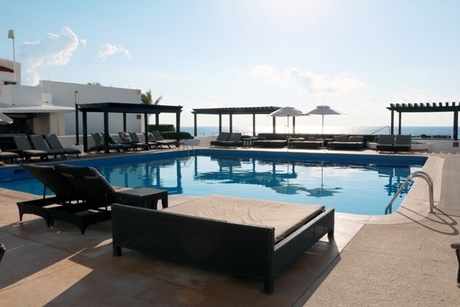 All guests who wish to play tennis will have access to the tennis court at GR Solaris Cancun. Reservations in advanced are required and could be confirmed with concierge department at the hotel. Roundtrip transportation is included. 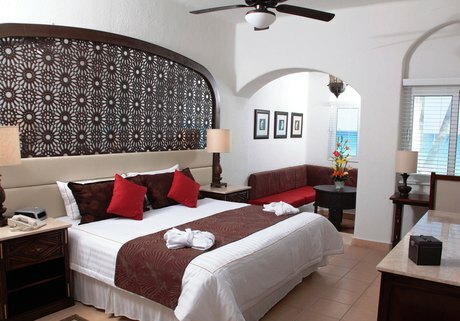 GR Caribe By Solaris Deluxe Resort is the best Cancun lodging choice for your trip to Mexico. With numerous amenities for guests such as room service, children's play area, 24 hour front desk, you will wake up at GR Caribe By Solaris Deluxe Resort feeling ready to go every day for your time in Cancun. Don’t let this amazing reservation opportunity pass you by, book your stay at GR Caribe By Solaris Deluxe Resort today to make the most of your time in Cancun, Mexico.